Using a Rosemark grip, Lydia Ko has an earning earning over $5 million in 31 events including the CME Globe bonus in 2015, and she won 8 events and 2 Majors! 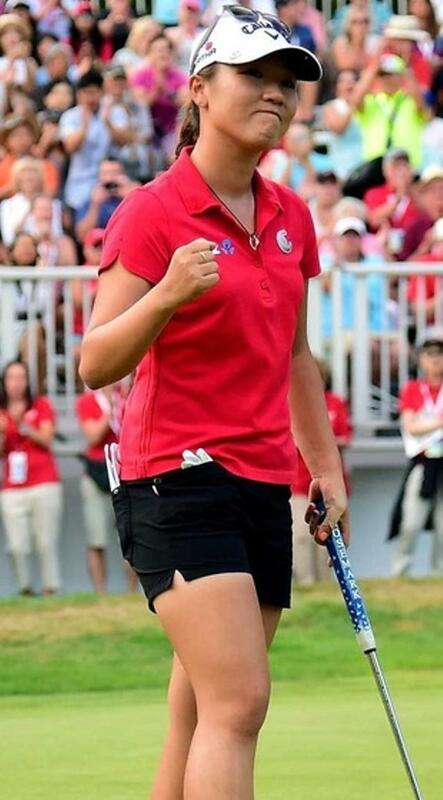 Her earnings, her putting (#1 on tour with Rosemark) her wins (8 worldwide) and her 2 Majors, were all much better with Rosemark than without and it's not even close! Rosemark putter grip technology offers, “tension free putting" for all golfers due to the unique patented shape, which perfectly “maps” the golfer’s hand. Rosemark putter grips are now available worldwide through Premium Golf Brands, which also owns and distributes SeeMore putters. What Rosemark’s development team came up with was a truly revolutionary, yet pleasingly simple and intuitive, design. All Rosemark grips share the same patented and premium design of a beautifully textured, tapered shape in several sizes with multiple angles in a hexagon shape around the grip, which completely conform to the shape of a hand. Rosemark helps the golfer set up square and keep the putter head square at set up and during the stroke, with the same minimal grip pressure that the best players in the world use. The Rosemark brand has won 3 Major Championships in less than a year. The FGP design is SeeMore’s most recognizable product, the flagship shape for the brand and the winning putter of 3 Major Championships and over 20 Tour victories. The smallest of the GIANT series, the Mini GIANT Stealth is created using 4 sets of non adjustable copper weights in the extreme toe and heel section as well as the perimeter of the sole, for the ultimate MOI to size ratio. Milled Aluminum head weight is 350 grams. Black Finish. Pitch Golf - New SPI based in the centre of London. Now stocking SeeMore Putters. Pitch is a new state of the art indoor golf studio in the City of London. 4 bays, all with latest GC2HMT and FSX software, Swing Catalyst and dual video integration. Executive custom fitting suite and “SamPuttLab” featuring SeeMore Putter brand. SeeMore Putters and Rosemark grips in Stock at Halpenny Lucan Store - shipment of the SeeMore Putters enables custom fitting of a putter that is 40% of your game and played by the tip players on Tour. Zach Johnson, Ernie Els, Nick Faldo, Vaughan Taylor, and all because they love the product. SeeMore Putter in stock at GolfIT - get your fitting booked to putt like a champion. Whether beginners, casual golfer, amateur or professional, all have in principle the same theme: With appropriate bats, the golf game becomes easier and thus more successful. "Matching racquets" start with a basic consultation for all levels, go through the selection of "matching" components (handles, shafts, heads) and listen with the clean setting of the Lie angles. In indoor and Fitting Center Heimsheim You can train, test, analyze Puttbewegungen measure lay lengths and of course playing indoor golf courses. We offer golf club construction with high-quality components specially selected for you and your game. 'One size fits all' fits in very rare cases: Take advantage of the opportunity to support through gefittete bat your game. Backed by the experience from the global ClubMaker associations ICG (International Club Makers Guild) , the IPAC (International Professional Association of Club Fitters) and GCA (Golf Club Maker Assocation, Golfsmith) the golf clubs are built according to the latest specially for you. In collaboration with Heiko Burkhard ( G1 golf teacher with the PGA of Germany and A- coach DGV / DOSB the nearby golf course ) with comprehensive advice on the material is possible up to the momentum. SeeMore Putters now in stock at Enfield Golf Club. Get custom fit for a club that is used for 40% of your game and is used by top tour professionals eg Ernie Els, Zach Johnson, Vaughan Taylor and up and coming Steven Tiley to name a few. Enfield was founded in 1893, are a friendly and welcoming private members Club in North London. Progressive and forward thinking, they have a modern approach to all Golfers and Visitors needs and pride themselves on offering excellent service and a superior customer 'experience'. A picturesque, 18 hole parkland Course and Clubhouse are situated in beautiful, tranquil surroundings and we are ideally located in North London, within easy reach of the M25, Hertfordshire and Essex. A family friendly Club, with something for everybody, and Members, Societies and Visitors, all receive a very warm welcome at all times. Welcome on board Chigwell Golf Club to custom fitting /selling / teaching with SeeMore Putters. Chigwell Golf Club is a traditional private members’ club set on undulating parkland the 18 hole, par 71, 6309 yard course, presenting a real challenge for the most discerning of golfers. After having received training from the Lee Westwood Golf Academy and travelling to The PGA of Holland to train with the Titleist Performance Institute, Henry brings new and exciting techniques to Chigwell. The professional team pride themselves on providing a quality service to all members and visitors and are on hand to guide visitors through their day at Chigwell. With 40% of your game being about putting why wouldn't you get custom fit. Having the right length, right grip and right posture and stroke could reduce your handicap and number of putts per round. SeeMore stockists don't just sell you an off the shelf putter, they custom fit the putter to your specification - the right length for the right posture and the right size grip. With a great range of putters you can select the head to suit your eye. Your PGA professional can support you with instruction and you probably have lessons for your short and long game but how often do you have a putting lesson. It is 40% of your game so perhaps worth booking one soon. It could be the answer to reducing your handicap! Pleased to announce that the Range of SeeMore Putters will be presented at the PGA show this week in Orlando, Florida, USA. Visit Booth #707 and say hello to the SeeMore staff - On display will also be the range of Rosemark Grips. With PGA Professionals using SeeMore every day on the Tour the brand is growing every day. Custom fit to meet your needs and ensure the correct, set up every time - Rifle Scope Technology (Hide the red dot) enables you to reduce your handicap. Additionally tension free putting with the Rosemark grip which is shaped to fit your hand can be the advantage you need. As our stockists and custom fit outlets continue to grow finding a location close to you is getting easier. We have a philosophy that with putting being a crucial part of your game and about 40% of your shots, having a custom fit putter could make a real difference. All of our outlets / stockists go through a certification process to enable and ensure you get the best experience and the right putter to meet your needs.